Doomers often argue population density is bad for oil use, as the population has become denser we need more oil to support the burgeoning population. As we have discovered in previous posts a great deal of oil use is powering cars, in fact nearly 50%. Therefore it is worth looking in detail at which people use cars, what for and in which areas. Most car trips are made by people who, in short, don't have access to public transport or can't be bothered to walk. It comes as no surprise that less population density, the less public transport there is. It's also further to walk! True the US style suburbia (which Kunstler hates) is badly planned because it's urban living which requires a car, but this is the exception rather than the rule. Most car trips are of some length in diverse rural areas. Peak oil is a significant (although not insurmountable) problem is these areas. Highly populated/topologically difficult countries like Japan and Switzerland have less use of cars. We can graphically see car use in cities too. 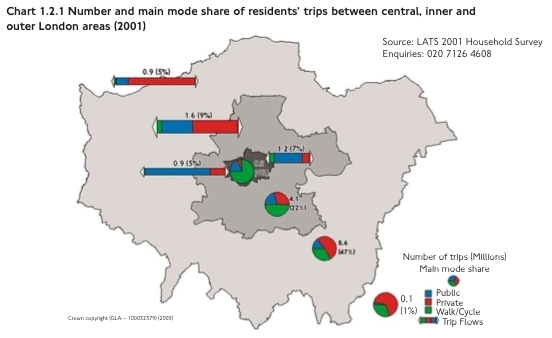 In London as population/land use gets denser, cars progressively become less relevant (click images to englarge). 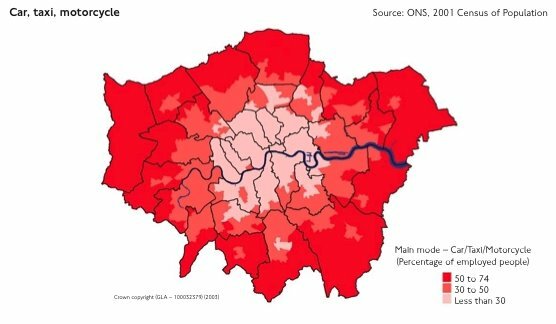 In central London they are irrelevant, although it should be noted that are large percentage of people coming in are from dormitory towns. Driving into a densely populated area is notoriously difficult because of space limitations. Why people make trips is generally the same in most countries, but their length and by which mode is diverse depending on the nation. In the UK around half of all trips are shopping (the most popular car trip), personal business and visiting friends. The latter has little effect on the economy, they are merely social calls. The former can, as is, be replaced by the internet. There is no reason these days to have everything other than local/very specialist shops/bars/restaurants/some clothes shops, accessible by walking. Most people could have their (main) goods delivered by electric vans from large (say rail/water served) warehouses located in towns. This has been going on for years in the UK with the delivery of milk. The result would be a massive cut in car/truck traffic, huge environmental benefits, a large cut in oil use, lower costs for retailers and families and more time spent at home, a complete win-win. There is another aspect to the decreased energy efficiency of low density suburban sprawl that is often overlooked. Single family houses of sprawl have a great deal more per capita exterior wall surface than the typical apartment buildings in high density urban areas. They also tend to have greater volume of interior space to heat. This creates much higher heating energy costs of low density. It also means that if we were able to maintain sprawlburbia by solving the obvious transportation inefficiencies then we will still be left with large volumes of building interior that would be left in the cold. I keep my apartment quite toasty without ever turning the heat on. This person speaks the truth. As to heating, I have a feeling power wont be an issue, there are a number of options to replace NG for electricity and you can just use a space heater. NG and Oil are seperate issues, why do people link them? One is a transportation issue, very hard to solve, the other one will arrive on a different date and is an energy issue that is solvable with *current* technology.